How Much Poker Money Do You Need To Play? Do you know the two most important things needed to play poker? Money and discipline. Without discipline you are destined to lose all of your poker money…and without money you won’t actually be able to play poker. This is why BRM, or bankroll management, is so important. A good BRM strategy ensures that you always have enough money to play in your games and withstand normal poker variance. A good general rule is the 20 buy-in rule which states a NLHE cash game player should always have at least 20 buy-ins for the level he’s playing…but this video/article combo goes a step further and looks at professional players and also shot taking. Enjoy! As we all know, there is a lot of variance in poker. Sometimes everything goes right and we feel like geniuses, and other times everything goes wrong and our opponents hit every flush draw against us. So it’s important that our bankroll can handle these common fluctuations (also known as variance). The common rule for NL cash game players is 20BI. So if you play $1/$2 live cash games and buy in for 100bb, or $200, then you should have a bankroll of at least $4,000. And if you play $25NL on online and buy-in for 100bb then you should have a bankroll of at least $500. This rule ensures that you never buy-in at the table for more than 5% of your bankroll. The idea is to have a big enough bankroll to withstand typical poker variance and lower your risk of ruin (aka risk of going broke). Now for a recreational player this isn’t as big of a deal. If you play poker as a hobby you can always add to your bankroll later with paychecks and savings. And if you play as a hobby you don’t fully depend on poker winnings to support you. Professional poker players on the other hand, ones who make most or all of their income from playing, will want much larger bankrolls. This is because they will take from their bankroll to pay their bills, they want an emergency fund in case things go wrong, and it’s really hard to play poker is you don’t have any money! And even moreso for professional online players who playing lots of tables and can easily have 20+ buy-ins spread across all of their games. For professional players I usually suggest closer to 50BI for live play and closer to 100BI for multitabling online. It’s conservative, but better safe than sorry when your monetary livelihood depends on it. The other aspect of “playing within your bankroll” is playing a level that your bankroll AND skills support. Just because you are a recreational player with $10k in the bank doesn’t necessarily mean you should be playing $400NL online. Sure you have 25BI for it, more than the 20BI minimum, but if you can’t beat $400NL what’s the point? You’d be better off playing a smaller game that you have positive expected value in than playing a higher game that you’d lose in…even if your bankroll would allow you to play it. All of this talk about bankroll management assumes that you are a winning player. If someone is a losing player then BRM would only prolong the time until they are broke. Let’s say you only have $100 to your name and you sit in this $100NL game. As we know 1BI is nowhere close to good BRM, and here’s why. Say EP open-shoves for $100 and it folds to you with AA in the BB. This is a great situation and the easiest call in the world! And for whatever reason, villain shows us he has KK which we obviously crush! However, like most poker situations, even though we are crushing our opponent he still has some equity and will win this hand a portion of the time. In fact, his KK has 18% equity against us which means not only will we lose 18% of the time…but we’ll actually be dead broke 18% of the time. And while this is an extreme example, just losing your poker bankroll 18% of the time would be awful. Again, it’s tough to play poker if you don’t have any poker money! First, notice the absolute worst performer in a 20 player simulation actually lost over 46buy-ins in this sample. It would be nice to be the player who ran +104 buy-ins…but we can’t all be huge luckboxes. So while 100k hands may seem like a lot, and even with a positive winrate, it’s possible to lose a lot of buy-ins due to significant runbad that none of us are exempt from. And second is the possible downswings. If we stretch the sample size to 1 million hands we see a player can hit three huge downswings of 37, 37, and 35 buy-ins. If a professional only used a 20BI bankroll he could have easily been wiped out by standard variance. A recreational poker player doesn’t fully rely on poker income and can always supplement their bankroll…a professional player doesn’t have that luxury if poker is their main income. I also want to mention moving up and down real quick, since this is directly related to BRM. First, is that if you use BRM the chances of you going broke are very small. 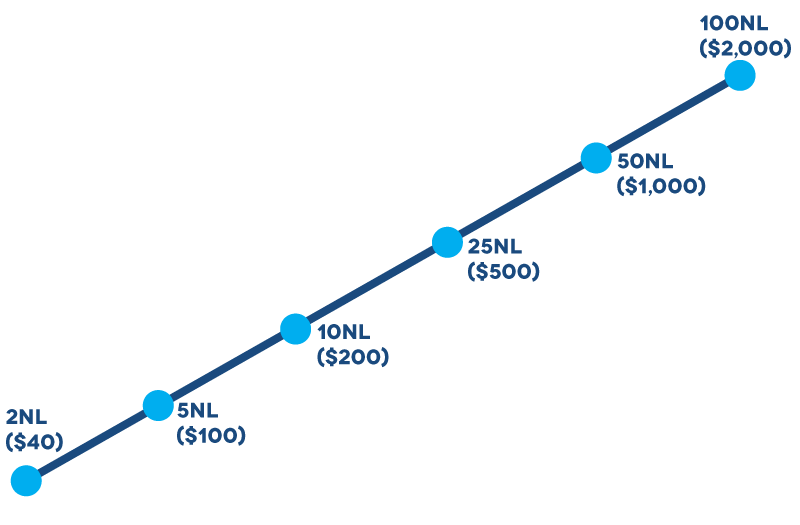 If you start playing 100NL with a $2K bankroll and overtime your bankroll drops to $1K, you should move down since you have a proper bankroll for 50NL. Assuming you keep moving down when your bankroll forces you to you would have to lose more than 50 buy-ins before you hit 2NL…which isn’t very likely for a winning player. If you aren’t sure if you are a winning player you should start at the smallest poker limits and go from there. Still adhere to the 20BI rule and start to see how you perform and then make adjustments as you go. As your bankroll grows higher and higher you may decide to move up to the next level. But don’t feel like you need to move up the second you have 20BI for the next level. You should consider moving up once your bankroll AND skill levels are big enough. If you don’t feel like you could beat the next highest level comfortably, keep grinding at the level you are playing until you and your bankroll are ready. BRM is a key principle of all winning poker players. Having enough money to keep you in the game and diminish your risk of ruin is huge. Don’t be an ego player. Play games you know you can win when you have the money to play them. If you don’t have the money or skill now, keep working to grow both your bankroll and ability. 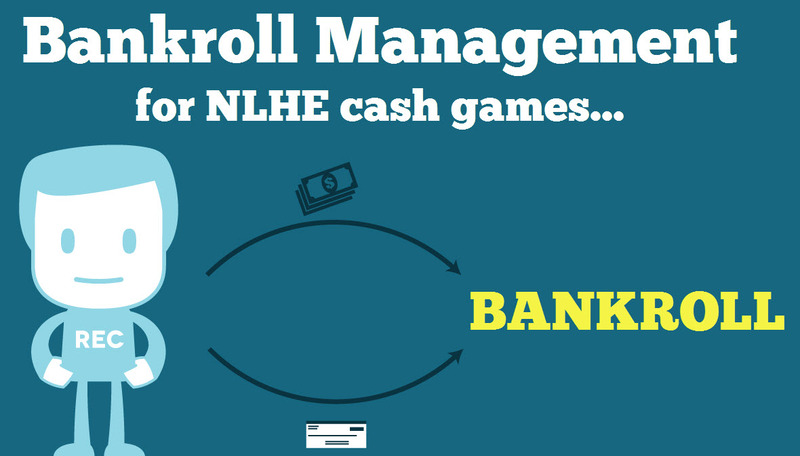 And one last note, is that you don’t have to bring your whole bankroll with you at all times. Just because you have $4,000 to play $1/$2 live doesn’t mean you need to bring $4K in cash with you the casino. Just make sure you have the $4k set aside as your poker bankroll so you can weather the variance. Same as always, if you have any questions please don’t hesitate to let me know. Otherwise, good luck and happy grinding!